The elm bar at ABV. Photo by Melissa Chow. 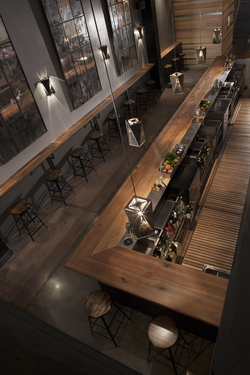 ABV’s bar, from above, with custom lighting. Photo by Melissa Chow. The mural from Nathaniel Russell at ABV. Photo by Melissa Chow. A report by Dana Eastland. As previously mentioned on tablehopper, there is a new taker for the former Tokyo Go Go space, and it’s a group with a great bar pedigree. It’s called ~ABV~ and is from Erik Reichborn-Kjennerud (who owns Dalva/Hideout), Ryan Fitzgerald (who worked at Beretta and who is currently the brand ambassador for Del Maguey mezcal), and Todd Smith (a Bourbon & Branch alum who’s currently behind the stick at Hideout). They’ve also brought on Kevin Cimino (opening sous of St. Vincent) to run the kitchen. The whole project is getting ready to open next week, and we’ve got a few details for you. 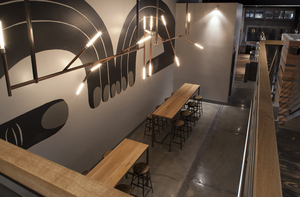 The space has been completely redone, with a long elm bar and a large mural of two hands by artist Nathaniel Russell. The mural is the focus of the front room, and sets a minimal, modern tone for the rest of the space. Most of the space is done in clean black, gray, and white, with custom tables and light fixtures designed by Fitzgerald and made by a friend and former regular (no Edison bulbs here). Interior designer Erin Altman worked on the space, as well, and designed the custom chandeliers in the back room. The space seats about 75, with a front room and another in back. The cocktail list was developed by all three of the partners, with a focus on offering drinks with San Francisco roots and themes. There are a couple of drinks in nine different categories: highballs, mezcal, tequila, gin, Scotch, rum, vodka, brandy, and American whiskey. The team is still working out the exact cocktail menu (their original version was a little ambitious, as you might imagine from the lengthy list of categories), but some highlights include the Land’s End (Jamaican rum, lemon, curaçao, raspberry gum), which they found in the original Trader Vic’s book, and the Piña Verde (blanco tequila, lime, génépi, pineapple gum, orange bitters), which takes its inspiration from a swizzle by Marcovaldo Dionysos (a rather legendary bartender at Smuggler’s Cove). They’ve also got the Dartmoor (Calvados, lemon, juniper-infused honey syrup, basil), which is based on a drink the Smith originally tried in London and modified into a new version called the Lawnsdale, which became popular at Beretta and Bourbon & Branch. They’ve modified it once again, making it closer to a smash and the British original this time around. As you can see, the list reflects not only the partners’ personal bartending histories in San Francisco, but also the city’s rich cocktail heritage; every drink has a story, a history, that’s rooted right here. They’ve also secured three beers on tap, all from Santa Rosa’s Moonlight Brewing Co., which can often be hard to find due to its limited production. 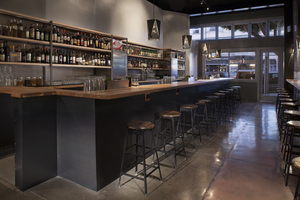 They will offer three wines on tap, all from Steve Matthiasson. While the drink prices haven’t been finalized, they are hoping to keep everything close to a relatively approachable $10, with some drinks clocking in around $8. As for food, the menu from chef Kevin Cimino is internationally inspired bar food, all of it intended to be eaten with your fingers. In fact, they won’t offer utensils or real plates—instead, look for compostable trays and plan to eat with your hands. The offerings are fun riffs on classics from all over the word, like the collard green “dolmas” stuffed with dirty rice, or chicken potpie empanadas. There’s also a pimento cheese burger, and a mapo sloppy joe, along with cheese and charcuterie plates. Take a look at the menu here, and be sure to note that almost everything on the menu is less than $10 (score!). Plus, the kitchen will be open until 1am daily. Right now, they’re hoping to open next week, but that could change. We’ll let you know when they’re ready to throw the doors open. Hours are 2pm-2am daily, with food until 1am. They may add some earlier weekend hours in the coming weeks too. 3174 16th St. at Albion, 415-400-4748.